Preparing meals is a labor of love in our home, and we enjoy involving our kids in the process. Unfortunately, several dangers like hot pans and boiling water don't mix well with curious toddlers. We found several ways to keep toddlers occupied, safe and supervised during meal prep. Maybe these suggestions will work for your family, too. Slick, smooth and slithery worms do so much more than play in dirt all day. They also teach your kids four important life lessons, making a worm farm an invaluable addition to your family's daily routine. What do teepees, imagination, green beans and children have in common? They all thrive outdoors! Learn how to build a green bean teepee as you create a natural play environment that's unique, fun and tasty. Kid friendly gardens are a must for anyone who plans to enjoy the great outdoors with their young ones. As more people are looking for ecologically friendly ways to inspire compassionate living in the younger generations, parents are increasingly looking for gardening ideas that are easy to utilize for children of all ages. Learning the importance of green living is crucial, and this rule applies particularly to today’s kids as they are building the world they will live in for the rest of their lives. By teaching children about eco-friendly and environmentally sustainable living, they can learn the value of the natural world around them and build a passion for keeping their planet healthy and safe. 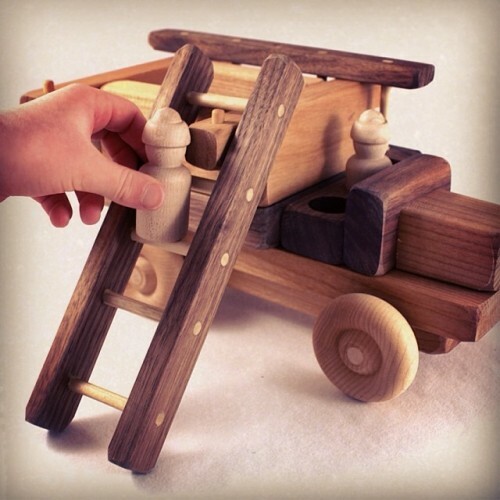 The handmade wooden Fire Engine comes with two firemen and two removable ladders.